We’ve just had the tail end of a cyclone and did it ever dump some rain on our city. One evening it was almost impossible to get anywhere as there was deep water across all the major roads. My seven minute trip from the office to home took one hour, several detours and back-tracking three times. Now, for most of us, cameras and rain don’t seem to naturally sit together, but if you throw away that aversion to water, there are many photo opportunities for something just a little different. But it does mean you have to look for those different images. So what did I see? The rain making circles on the surface of the little pond with my two tame catfish hiding from the drops (seems like they didn’t want to get wet)! Another was beads of water on the boot lid of the car and when I looked up, there was a leak from the drainpipe and that produced some very interesting images and I have printed one here. I experimented with different shutter speeds and also taking shots with and without flash. These all produced different images, and is something every photographer can do, by taking the camera off “Auto” and just seeing what you get. One shot of raindrops on the boot lid looked like the surface of the moon with over-exposure. But back to the shot I used here, the down-pipe. 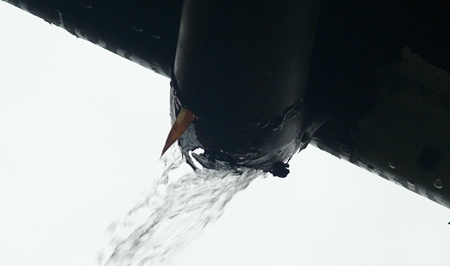 I began just taking the water coming from the bend in the pipe, but then I turned the camera 45 degrees and it began to look like an airplane with fuel pouring out from the fuselage. OK, you have to use your imagination a bit, but that is what makes photography so interesting. This is as apart from taking “record” shots of the children at the temple. Children and rainy weather do present some wonderful opportunities. During the heavy rains, there were children in little creeks beside the road, having a wonderful time. Many children to photograph, as long as you were prepared to get wet too. But here comes the problem. You may know you are trying to get the best shot ever of little Johnny, but little Johnny doesn’t know it. And what’s more, doesn’t care! With a short attention span, he is not going to stand still long enough for you to fiddle around with camera settings, flash settings and exposure mathematics. No, when photographing children, use the Auto setting on your camera, and that is one of the few times I will recommend that setting! No, to get a good kid pic means that you have to be totally set up and ready for that nano-second of opportunity. Let’s look at the equipment needed first. In general, the further away you get, the more natural the photograph you will get, as the child does not see you in the proximity. So, a small zoom lens (35-70) works very well in this situation as you can get far enough away from the child without invading the child’s ‘personal space’ and producing shyness or forced behavior, but longer is better. In my case, I use a 135 mm lens for kid pix (as I didn’t want to get my feet wet either). Some photographers swear by Auto-focus (AF) for this type of shot, but personally I find that the noise is distracting for children. The “whiz-whizz” and then a correct focus ‘beep’ distracts for the three point four milliseconds attention span children have, and then they are off again. However, the newer AF cameras (lenses) are much quieter and are probably the best in this situation. When it is raining, it really does mean another photographic opportunity to get different shots. Since we get bright sun for 11 months a year, make the most of the rain! It is a simple case of being prepared and then just jumping in to get the shots, with kids don’t stage manage, and lots of luck! Previous articleJohnny to the rescue!